The Mediterranean Sea is almost a closed basin. It is connected with the Atlantic Ocean through the Strait of Gibraltar - 15 km wide, average depth of 290 m and a maximum of 950 m. The Dardanelles, which connect it with the Sea of Marmara, are between 450 m and 7.4 km wide and 55 m deep. The Suez Canal is 12 m deep and 120 m wide and connects the Mediterranean with the Red Sea. 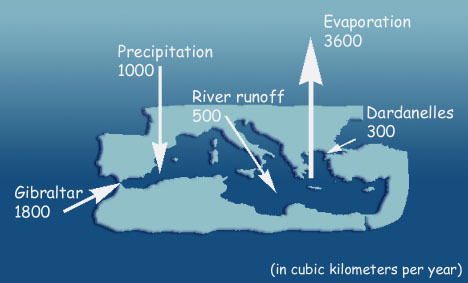 The Mediterranean Sea has a negative hydrological balance with loss through evaporation exceeding the input of water through runoff and precipitation. This deficiency is mainly compensated by the flow of Atlantic surface water through the strait of Gibraltar and the Dardanelles. On the output side of the balance the evaporation of about 3600 km3/year is very strong during winter and spring due to the dry continental winds, prevailing in this period. Here follow some links to sites with models and pictures of the exchange proceses through the straits. - information about all ports in the Mediterranean and Black Sea.